"This recipe is an old family favorite that we enjoy from time to time. 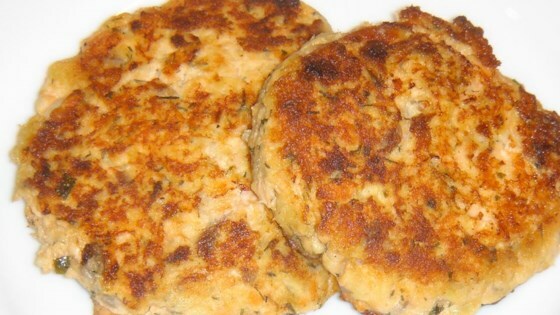 It's hearty, flavorful and great alternative to hamburgers! Substitute cubed cooked potatoes for the bread, if you like." Mix together salmon, bread, onion, all-purpose flour, egg, salt and pepper. Shape into four patties. This was a very easy recipe. Also, we don't eat fried foods so I just broiled it in the oven. It was great! These are good! Very easy. I used left over salmon and rye bread and did not use oil, pan grilled using PAM. Really good! I followed the directions exactly with the exception of adding a little Old Bay. Excellent! Thanks for sharing! Delicious in its simplicity! E1 loved them. I added cayenne & onion powders along w/ a little italian seasoning and parsley flakes.